Explore the evolved landscape of Tokyo NXT for Keynote: a bold, modular design blended with classic, structured type in a triad of eye-catching, updated colors. Tokyo enters the NXT era. The Tokyo themes have evolved in the transition to NXT, adopting more refined grid and color specifications, along with Keynote 6+ optimizations that make Tokyo easier to customize than ever before. The Tokyo themes have long been consistent fan-favorites, appreciated for their sense of balance between modern sensibilities and traditional information design. Tokyo NXT - our latest next-generation Keynote theme - builds on the traditions of those previous releases while adopting more refined grid and color specifications, along with a host of architectural improvements to propel Tokyo into the NXT era. Built on a foundation of a soft electric glow, Tokyo juxtaposes a shifting, modular framework against classical grid-based layouts and type to create a highly stylized, structured framework that's well suited for a wide variety of high-tech, corporate & finance or general-purpose presentations or topics. Tokyo NXT includes three complete themes - Tokyo R, P and G - giving you stylistic flexibility from your first slide forward. 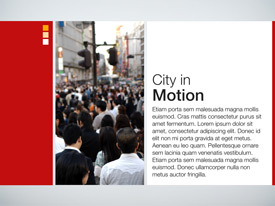 The included layouts - from traditional text-oriented slides to single and multi-photo-oriented layouts - feature clean, easy-to-read type on contrast panels that impose a subtle structural order on the layout areas. 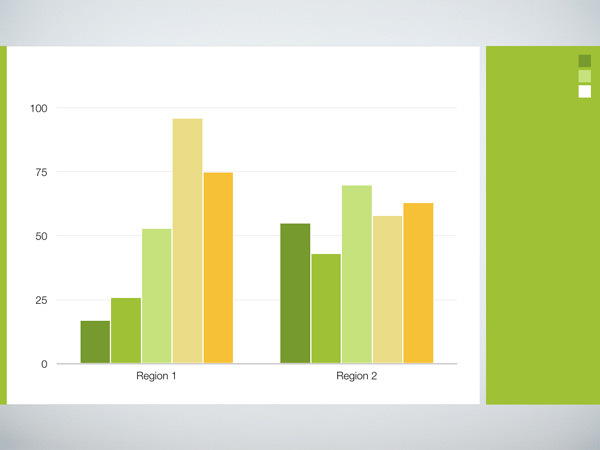 The accompanying chart palettes are accenting tonal blends, customized to each of the three signature colors, including both broad and narrow mono/duotone options in Keynote 6+. And thanks to the new Keynote 6.x-9.x optimized architecture, you can now customize every aspect of your Tokyo presentations more easily than ever before. The Tokyo themes have been redesigned from the ground up in the evolution from '08 to NXT, retaining the soul and style of the original RPG themes while refining the grid, palettes and slide types to be more flexible than ever before. The entire master slide library has been overhauled with a less-is-more approach, eschewing dated or retired masters in favor of more focused, targeted variations around an expanded range of core content models - yielding a smaller library that manages to offer more versatility than ever before. The backgrounds and three signature palettes have been evolved for better balance against a wider range of projection and handheld presentation scenarios than prior editions. And the Tokyo NXT themes are fully optimized for the new Shape, Text and Chart Styles introduced in Keynote 6, so you can customize the principal color and type styles used throughout the entire theme to match your own corporate color or type standards in just a few short clicks. 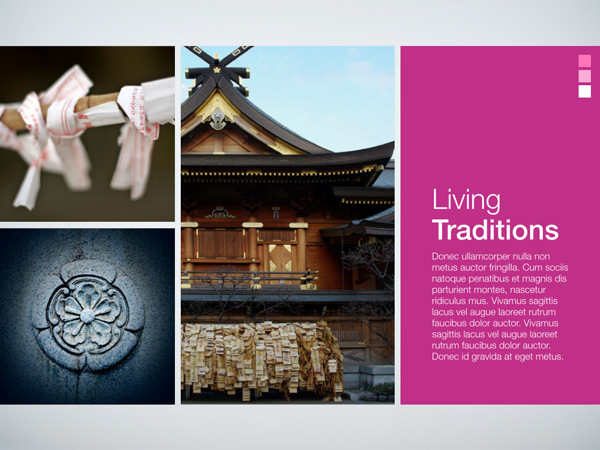 The Tokyo NXT themes feature a wide range of text + photo layout options - including both stand-alone and multi-image slides - designed to provide exceptional flexibility while maintaining a focused, structured and consistent look slide after slide. 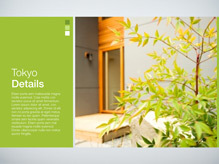 The Tokyo NXT themes include 34 master slides - a mix of content and image-driven layouts in the signature Tokyo style. The core layouts encompass a full range of general-purpose styles, each striking a careful balance between color-contrast accents and content-driven layout regions. Along with the basic text and photo layouts present in any Keynote 6.x-9.x theme, Tokyo NXT includes an expanded selection of content-oriented masters, including Percentage Compare & Contrast, Quotation, Numbered Section Header, multi-column and captioned layout/photo slides. 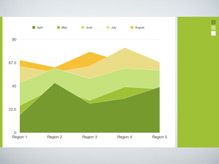 The accompanying chart fills - including both a colorful, broad-spectrum primary palette along with a more subtle, mono/duotone blend in Keynote 6 - extend the clean, structured feel to your data with a professional flair that translates well from screen to print. Widescreen (HD) Themes, available in the Tokyo NXT Pro Edition, expand the style into widescreen format with aspect-optimized HD versions of the Tokyo NXT design, so you can take advantage of the clean simplicity of a an iMac, Mac-driven HD Display or Monitor, or HD projection system as target presentation platforms without the letterboxing associated with running traditional 4:3 presentations on widescreen. Whether attached to an HD display or projecting to an HD-equipped room, your presentation will take full advantage of every inch, custom-tailored to intelligently adapt the Tokyo NXT aesthetic to the larger footprint of HD. Can't imagine leaving your favorite portable device out of your work-flow? The Tokyo NXT themes are fully compatible with Keynote for iOS and iCloud, so you can transfer a presentation using the Tokyo themes to your iPad, iPhone or iCloud Drive for playback or editing with no updates or special workarounds required. And Tokyo NXT is also iOS Direct Install enabled, so you can install the Tokyo themes directly onto your mobile device from your KeynotePro Account to author new presentations on the go. Keynote for iOS is a beautiful way to engage your audience in a tactile way, and the Tokyo NXT styles remain just as stunning at arm's length as it is projected on the big screen. The OM NXT Supplemental Materials file includes the three OM palettes, pre-linked Button Objects for copy-paste ease in interactive presentations, along with a DIY color change reference that walks you through changing the color scheme for an entire presentation or a single slide. The Supplemental Materials are installed right in your theme directory, ready to reference whenever you're building an District presentation. 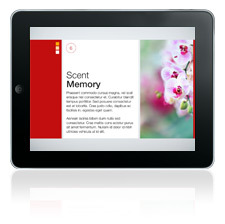 Keynote gives you the power to create highly-styled presentations with incredible ease and flexibility. From the razor-sharp text and professional charting capabilities, to the wide range of native graphic format support that give you unprecedented flexibility with your imagery and media, it's never been so easy to look so good - from presentation screen to printout & beyond - with so little effort. And thanks to the new Shape and Text Styles introduced with Keynote 6, it's never been easier to customize every aspect of your Tokyo presentation. Keynote makes it a snap, and Tokyo NXT makes it look great every step of the way. The Tokyo NXT chart palettes are subtle, tonal blends - customized to each of the three colors - that are both understated and eye-catching. 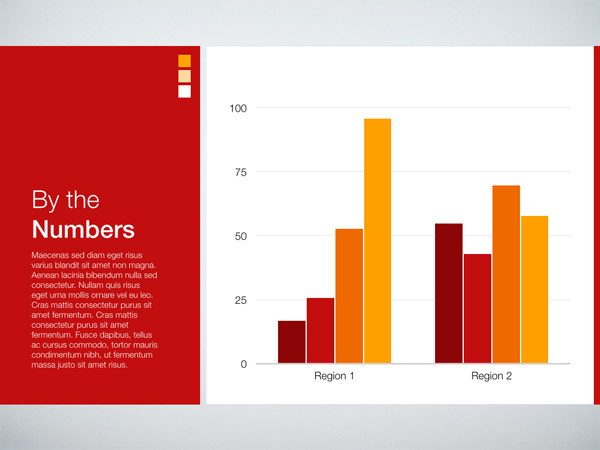 The Tokyo NXT themes are fully optimized for the new Chart Styles palette in Keynote 6, including two mono/duotone blend palettes in each version of the theme. View the available Master Slides for the Tokyo NXT Themes. Tokyo NXT in Action. View a sample Tokyo NXT presentation in Quicktime. Requirements. Tokyo NXT requires Keynote '09 (5.x) or higher, and the Helvetica Neue font face. All photos shown for demonstration purposes only. iWork, Keynote,Quicktime, Mac, iMac, iPod, iPhone, iPad and the Apple logo are trademarked properties of Apple Inc. If you're a registered user of Tokyo RPG '08, you can Upgrade to Tokyo NXT at a reduced cost: Log into Your Account to view all available Version Upgrades. Users who purchased Tokyo '08 (any Edition) on or after July 31, 2014 have been updated to the respective NXT Edition at no charge - Click on Your Account in the main toolbar to log in when you're ready to download. Standard Definition (SD) Themes, Supplemental presentation containing Fills/Palettes, Text Accent and Interactive Button objects, "Getting Started" guide. Standard Definition and Widescreen (SD/HD) Themes, Supplemental presentation containing Fills/Palettes, Text Accent and Interactive Button objects, "Getting Started" guide. Tokyo NXT does not have a Pages Component.